The gallery on the Galaxy Note 3 Neo has the same layout as the one on the Galaxy Note 3. It can be sorted into albums, all photos and videos, time, location, etc. You can pinch to zoom in the gallery and thus manage the size of the thumbnails. Air view works in the gallery as well. You can hover your finger above an image and you'll get a bigger thumbnail preview of the image or you can use it to peek inside folders. Upon choosing an album (for instance Camera) you're taken into that albums' stack of photos but a swipe to the right will reveal a bar on the left with all the albums. This means you can change albums without going through the gallery homescreen every time. When a press and hold on a picture the gallery gives you the option to select multiple images, which you can then mass delete, share, copy or move. Viewing photos on the Samsung Galaxy Note 3 Neo is a joy. The screen is ample and the Super AMOLED can give you colors punchier than anything else on the market. If you know what "color profile" is you can enable the Adobe RGB screen mode for accurate color rendering, if not you can just enjoy the vibrant colors of the default setting. The My Files app hasn't changed a great deal - it is an efficient and simple to use file manager. It can move, copy, lock and rename files in bulk, even send multiple files to another phone. My files will only browse the memory card and the large internal storage (it can't access the system drive). The TouchWiz music player on the Galaxy Note 3 Neo is jam-packed with features and supports a wide variety of file formats, including FLAC and Wave. Music is sorted by the usual Artist, Album and Playlist criteria but there's also Folder support (which is more often found on third party players) - it's quite handy as it saves you the need to sort songs into playlists like on many of the Galaxy Note 3 Neo competitors. The Samsung Galaxy Note 3 Neo has a couple of features that will improve your listening experience further. One is Smart Sound, which equalizes the volume between tracks. The other is Adapt Sound - it plays a series of beeps (both high and low frequency) and asks if you can hear them. This way the phone can map the capacities of your specific headset and fine-tune its output for optimal sonic experience. After the calibration is complete, the Galaxy Note 3 Neo shows you the kind of gain you're receiving by keeping Adapt Sound on. The video player, found on the Samsung Galaxy Note 3 Neo, has the last watched video on top for quick access. Under it there are three tabs - personal (showing you the videos on your local storage), Download (which lets into the Videos store) and Nearby devices, which shows the PCs and players on your local Wi-Fi network. The grid view is here, showing you previews of your library so you can easily locate a specific video. 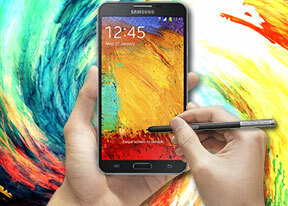 The Samsung Galaxy Note 3 Neo offered a list of subtitles and let us pick. It scans for all subtitles, so the file doesn't have to have the same name as the video file. 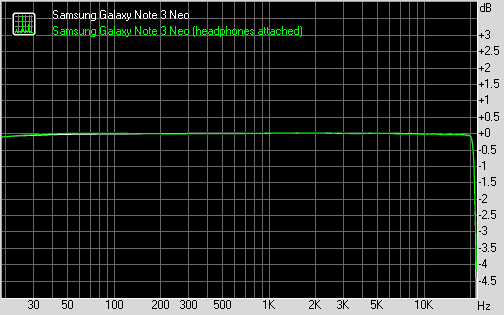 The Samsung Galaxy Note 3 Neo audio output is every bit as impressive as that of its more premium namesake. The phablet aced the first part of our test, posting perfect scores top to bottom. The volume levels were about average. There's next to no degradation when you plug in a pair of headphones. Outside of the little extra stereo crosstalk, the Note 3 Neo is as perfect as in the first test. And its volume levels are even better for the scenario, making this a great overall performance.